The Chinese Communist government places a high priority on the development of industry in its national economic plans. Anxious to show advancement, it has published gross values of industrial production for the years prior to 1961 and corresponding indexes. Many of these data are biased and unreliable. 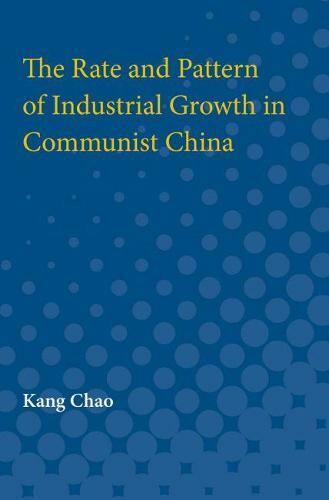 In The Rate and Pattern of Industrial Growth in Communist China, Kang Chao carefully reconstructs two sets of industrial production indexes that are more meaningful and reliable. He also lays out the statistical procedures necessary to construct new indexes that reflect fundamental economic facts in contrast to official statistics. His approach represents an excellent model for others to follow in index-making for countries with limited output statistics and production cost data. The appendix contains valuable tables on China's industrial output, commodity by commodity, as well as on industry employment, wages, and prices. These tables were compiled from diverse and scattered sources and represent the most comprehensive compilation for that sector ever to appear except for the classified statistical documents of the Chinese Communist government.